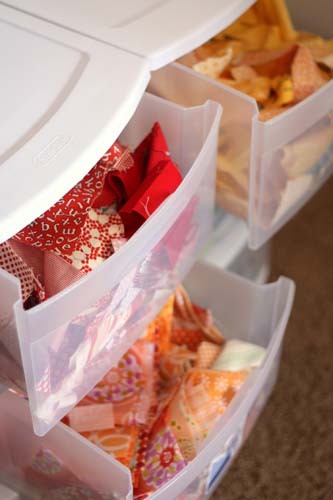 It’s the beginning of a new year, and many of us have resolved to organize our sewing spaces and stashes. But where to start? 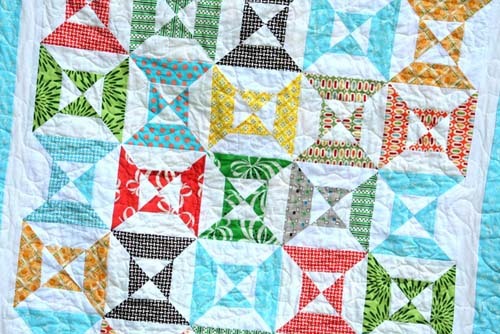 Amy Smart from Diary of a Quilter shares tips for making the most of your scrap fabric stash, including a dozen scrap-busting projects. As fabric lovers, we know the value of finding that perfect fabric for the perfect project and then carefully maximizing that piece of yardage so that we can get the biggest bang for our buck. As a result, we all have those leftover scraps that we don’t want to see go to waste. They’re kind of like precious orphans that we can’t bear to see cast aside. But after a while, those fabric scraps can tend to multiply like rabbits until they start to take over your sewing space. At the beginning of the new year we all love the thought of getting better organized. 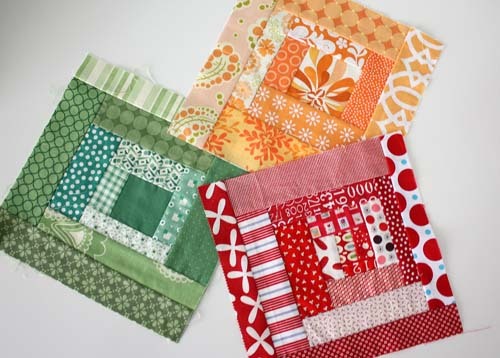 In this post I thought I’d share some ideas and suggestions about taming your scraps so that they’re more inspiring and useful as well as give you a list of projects for putting those scraps to good use. First of all, sort your scraps. 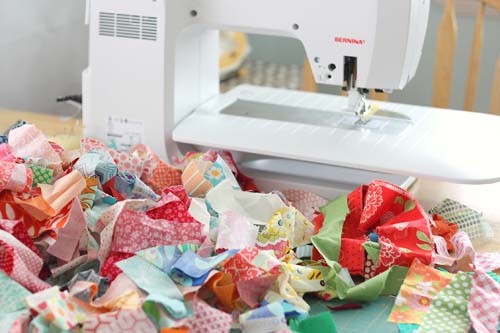 If you have been accumulating fabric scraps for a long time, you may have a lot of scraps. And your tastes might have changed in that time. Don’t be afraid to get rid of some of your scrap-stash. Part of being motivated to actually use your scraps is only having on hand scraps that inspire you to create something. If you feel pangs of guilt about getting rid of some of them, then take them to a local quilt guild or donate them to someone else who will give your scraps a new home and life. To make your scraps more efficient, sort them by color. I currently have my scraps sorted by color because for me that is the most inspiring way to use them. 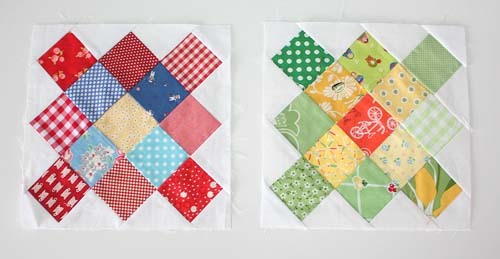 It’s fun to pull them out and use them for improv log cabin blocks (inspired by Elizabeth Hartman’s Paint Box quilt). 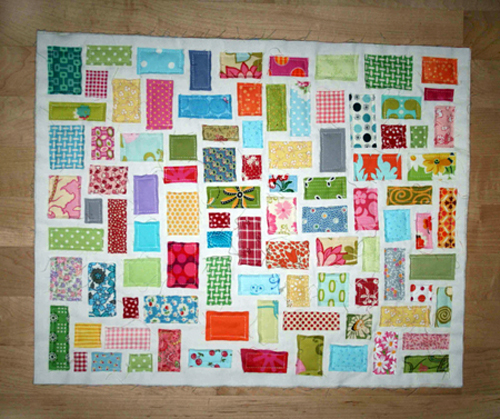 Or use scraps to make bigger pieced fields or ‘slabs’ such as in this Rainbow Connection quilt that I made. Another effective use of monochromatic scraps is Red Pepper Quilt’s Zig Zag Rail Fence quilt. Another efficient way to sort scraps is by size. Quilt patterns using manufactured “precuts” (fabric in pre-cut sizes such as 5” squares or 2-1/2” x 42” strips) are widely available and very popular right now. You can collect your own pre-cuts by cutting fabric remnants into the same sizes as the manufacturers sell. That way you have a selection ready to go when you find just the right pattern. I tend to cut and save a lot of 2-1/2” squares. One of my favorite uses for them is this Granny Square block tutorial from Blue Elephant Stitches. 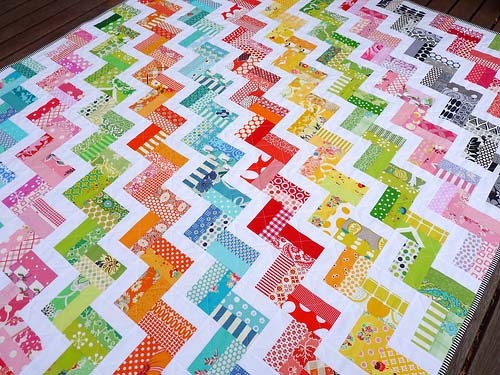 This easy Double Hourglass block quilt by Allison of Cluck Cluck Sew is made from using 2-1/2” strips. 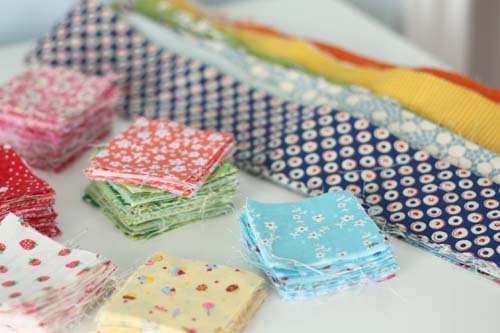 One tip to keep in mind when using a large variety of scraps is to have a unifying color tie everything together. 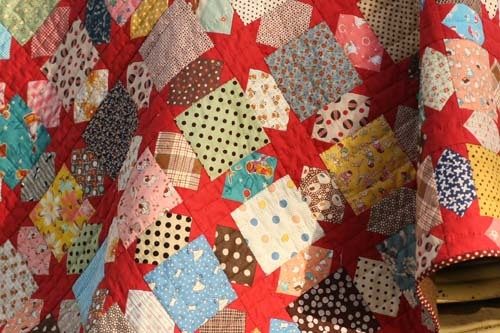 If you look at Depression-era Feedsack quilts, they are often contain a wide variety of colors and prints, but are tied together by a unifying solid, usually as a background. This quilt by my friend Calli, called Oh My Stars, is made from a wide variety of scraps, with the red stars as the unifying color. 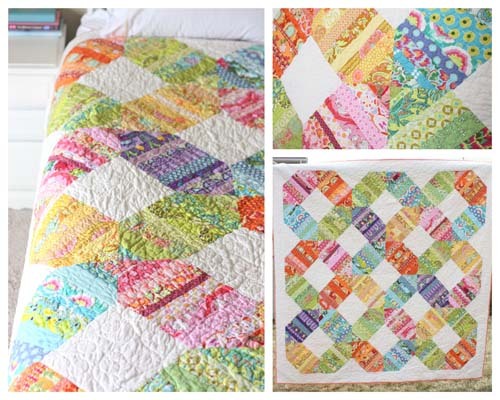 Ticker Tape Quilt tutorial from Amanda Jean Nyburg. 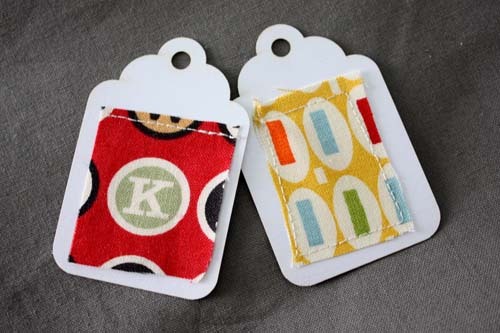 Gift tags from A Spoonful of Sugar. 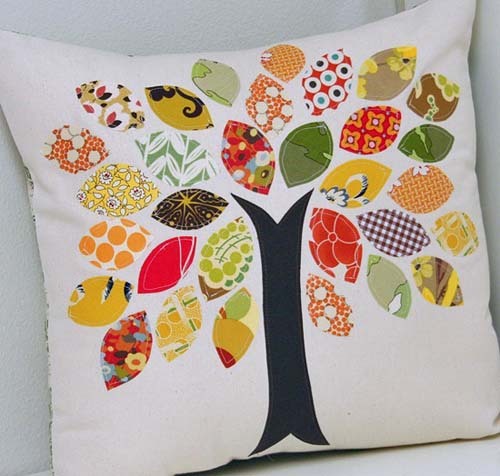 Applique Tree Pillow by Allison of Cluck Cluck Sew. String Foundation block inspired by this Film in the Fridge tutorial. 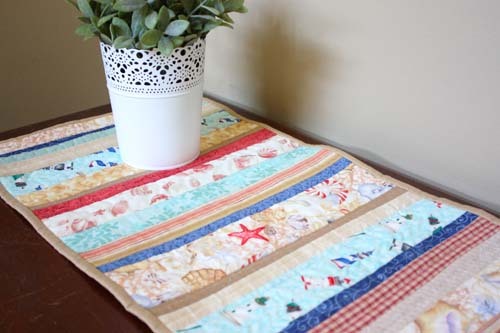 If you’re looking for other projects besides quilts, this quilt-as-you-go Table Runner is a quick and versatile project. And finally, English paper piecing. This is typically a hand work project. 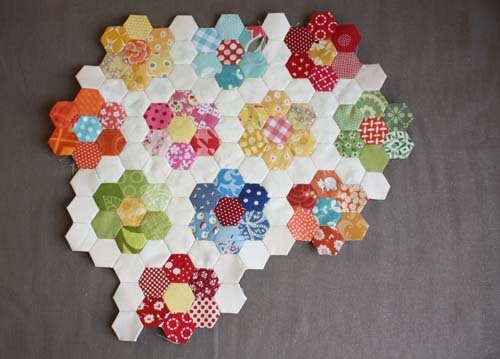 I carry a little box of scraps in the car and use them for my tiny hexagons. 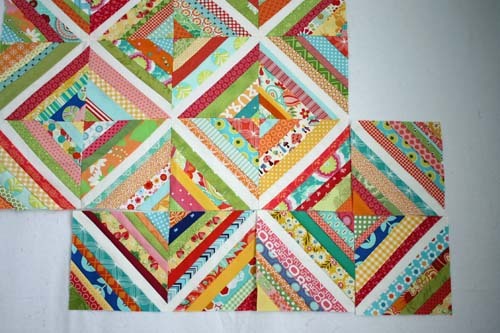 Heather has a basic English Paper Piecing tutorial at The Sewing Loft. I guarantee, it’s so satisfying to find a way to use up those scraps and give them a second life. The keys are purging and organizing – making your scrap pile appealing so that you’re motivated to dig in and make something pretty with those scraps!